The mystery potsherds sat in storage until 2011, when Mélanie Roffet-Salque pulled them out and analysed fatty residues preserved in the clay. Roffet-Salque, a geochemist at the University of Bristol, UK, found signatures of abundant milk fats — evidence that the early farmers had used the pottery as sieves to separate fatty milk solids from liquid whey. That makes the Polish relics the oldest known evidence of cheese-making in the world (1). Roffet-Salque's sleuthing is part of a wave of discoveries about the history of milk in Europe. Many of them have come from a €3.3-million (US$4.4-million) project that started in 2009 and has involved archaeologists, chemists and geneticists. The findings from this group illuminate the profound ways that dairy products have shaped human settlement on the continent. This two-step milk revolution may have been a prime factor in allowing bands of farmers and herders from the south to sweep through Europe and displace the hunter-gatherer cultures that had lived there for millennia. “They spread really rapidly into northern Europe from an archaeological point of view,” says Mark Thomas, a population geneticist at University College London. That wave of emigration left an enduring imprint on Europe, where, unlike in many regions of the world, most people can now tolerate milk. “It could be that a large proportion of Europeans are descended from the first lactase-persistent dairy farmers in Europe,” says Thomas. Most people who retain the ability to digest milk can trace their ancestry to Europe, where the trait seems to be linked to a single nucleotide in which the DNA base cytosine changed to thymine in a genomic region not far from the lactase gene. 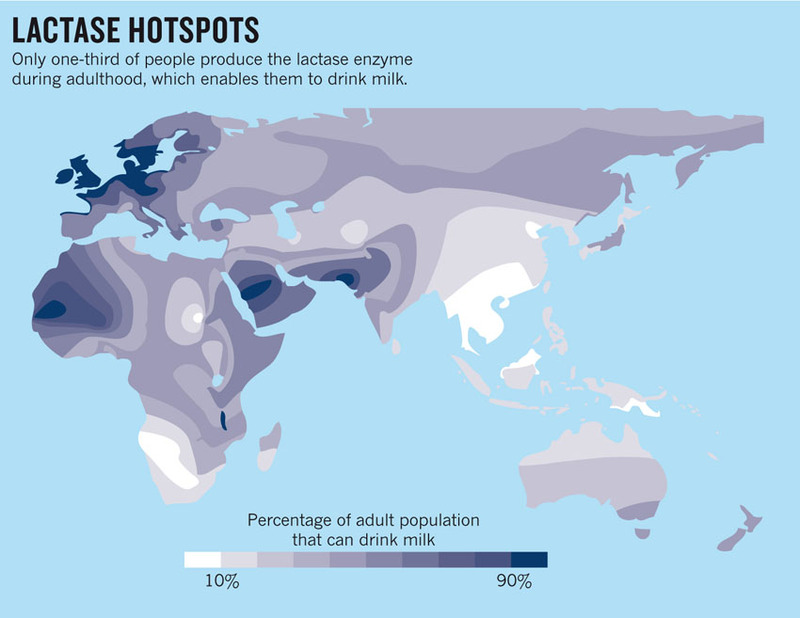 There are other pockets of lactase persistence in West Africa (see Nature 444, 994–996; 2006), the Middle East and south Asia that seem to be linked to separate mutations (3) (see 'Lactase hotspots'). The single-nucleotide switch in Europe happened relatively recently. Thomas and his colleagues estimated the timing by looking at genetic variations in modern populations and running computer simulations of how the related genetic mutation might have spread through ancient populations (4). They proposed that the trait of lactase persistence, dubbed the LP allele, emerged about 7,500 years ago in the broad, fertile plains of Hungary. Once the LP allele appeared, it offered a major selective advantage. In a 2004 study (5), researchers estimated that people with the mutation would have produced up to 19% more fertile offspring than those who lacked it. The researchers called that degree of selection “among the strongest yet seen for any gene in the genome”. To investigate the history of that interaction, Thomas teamed up with Joachim Burger, a palaeogeneticist at the Johannes Gutenberg University of Mainz in Germany, and Matthew Collins, a bioarchaeologist at the University of York. They organized a multidisciplinary project called LeCHE (Lactase Persistence in the early Cultural History of Europe), which brought together a dozen early-career researchers from around Europe. By studying human molecular biology and the archaeology and chemistry of ancient pottery, LeCHE participants also hoped to address a key issue about the origins of modern Europeans. “It's been an enduring question in archaeology — whether we're descended from Middle Eastern farmers or indigenous hunter-gatherers,” says Thomas. The argument boils down to evolution versus replacement. Did native populations of hunter-gatherers in Europe take up farming and herding? Or was there an influx of agricultural colonists who outcompeted the locals, thanks to a combination of genes and technology? Dairying then expanded in concert with the Neolithic transition, says Gillis, who has looked at bone growth at 150 sites in Europe and Anatolia (modern Turkey). As agriculture spread from Anatolia to northern Europe over roughly two millennia, dairying followed a similar pattern. On their own, the growth patterns do not say whether the Neolithic transition in Europe happened through evolution or replacement, but cattle bones offer important clues. In a precursor study (7), Burger and several other LeCHE participants found that domesticated cattle at Neolithic sites in Europe were most closely related to cows from the Middle East, rather than indigenous wild aurochs. This is a strong indication that incoming herders brought their cattle with them, rather than domesticating locally, says Burger. A similar story is emerging from studies of ancient human DNA recovered at a few sites in central Europe, which suggest that Neolithic farmers were not descended from the hunter-gatherers who lived there before (8).